It's a sunny day, and I'm back in the land of pet dogs, quiet streets and clean skies. I'm on a break from Asia, visiting friends in North America. As you know, friends are always changing, but changes seem more obvious when you've been away for a while. I notice that some of the biggest changes are in my littlest friends. One intelligent little ten-year-old has been my friend for at least five years. In times past, he told the wildest stories, kept me laughing with off-the-wall comments, sat next to me at family gatherings, and always tried to steal me away to jump on the trampoline after lunch. In a word, he was vivacious. But he's ten now, and taller than ever. When I saw him last week, he didn't say much to me. His usual zest was strangely missing. The second time he saw me, he took me to "his" lake (down the long route, through mosquito-filled woods) to a broken-down dock. The woods are where he feels comfortable, looking for birds' nests, catching frogs and confidently dispensing nature facts. He told me how Grade Three passed slowly, and was filled with adventures. But Grade Four passed quickly—he explained sagely, "that's what happens when you get older." But the third time he saw me, he stretched his thin arms around me for a hug. It was informal and unpretentious, a natural extension of our long-time friendship. It was almost like old times, with some new times mixed in. Ten is quite different than five. Less carefree, less trusting. Loving at ten might look different than it did at five—but it matters just as much. Don't we all wish for friends who will love us in our gangly years, in the transitions and messiness and questioning of growth? 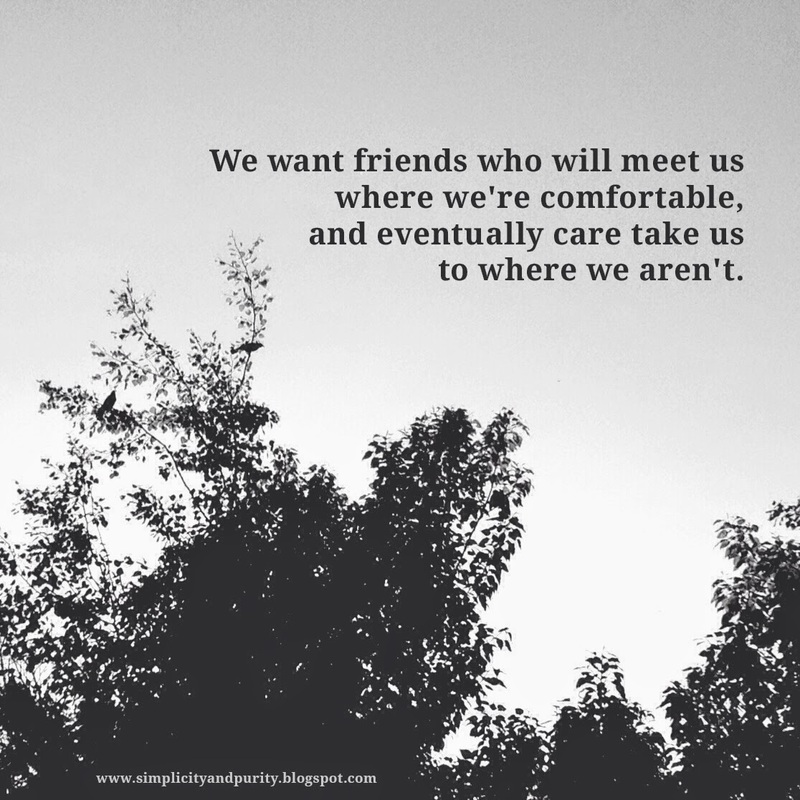 We want friends who will meet us where we're comfortable, and eventually care take us to where we aren't. We want friends who are content to lie on an old boat dock and wait for us as we poke around. Friends who won't think we're crazy when we stir up ant nests with long sticks or insist on balancing on a railing just to see if we can. Friends who will put away their smart phones and be fully engaged in the moment. Friends who will listen before they speak, and when they speak, use wise words. Who will rebuke us when it's needed, but encourage us when it's not. We want people who will keep getting to know the ever-evolving "us" and love us anyway—in a way that points toward Him. This morning I visited another friend, who is a few decades older and wiser than my little ten-year-old man. We met in a comfort zone, too, of her home. We ate breakfast in the dining room like proper friends might do, but then we also stood in the kitchen and soaped up a pile of leftover Father's Day dishes like real friends do. (Families leave messes and sorting and cleaning them up takes time.) We chat just as easily at the sink as we do on the sofa. Four hours later, the dishes are washed and dried and we're drinking tea. There is still so much to say and discover, and I leave with more conversation still waiting inside me, and some encouragement and insight gained. Things have changed so much since we met. We've travelled to and lived on different continents. We've gained and lost: jobs, weight, friends, hopes and dreams. But mostly we've grown: as individuals, as friends and as Followers. As I listen to my friend speak, I hear a woman who is deeper than most, and wiser than ever. She's not the same woman I met five years ago either—she's growing up in Him. We've seen each others' soul stretch marks and still found beauty in each other: God is expanding us to fill us with more of Himself. but it matters just as much.